Our task was to support a wider 'on-boarding' recruitment marketing campaign to welcome new students to UofG. This would be a multi-stage social media campaign, kicking off when students received their exam results and in a nutshell saying 'Yay, you're in and part of #TeamUofG' with various videos, gifs and photos from our UofG community (coinciding with #TeamUofG tattoos flying through their letter boxes). Just to give this some context - we worked with marketing to produce temporary #TeamUofG tattoos sent to offer-holding students including messaging to snap or tweet us their TeamUofG photos as they officially joined UofG. This was to encourage lots of student generated content and create a sense of pride, celebration and most importantly, community - which we could pull into a #TeamUofG Wall of Fame. So we had the elements of a great campaign but we realised like Jon Snow in GoT that we would only prosper if we joined forces with Daenerys and her army - not sure the UofG Social Media community would like to be seen as dragons - but you get my drift! We needed the whole UofG social media community behind us to achieve the broadest reach and biggest welcome to our new students as possible. So, how did we rally the internal UofG social media community? 1) Inviting our UofG SM community to come to a #TeamUofG briefing meeting - dishing out tattoos, launching the campaign video and providing them with a document detailing example social posts and ways to engage with the campaign, and when. 2) Creating on-brand #TeamUofG digital assets which could be used as cover shots, gifs, images and videos. (More on this coming in Dan's Part 2 blog post about the creative elements). 3) Our SM community would become #TeamUofG ambassadors for us in their Service/School/College and encourage other staff and students to get involved. And this proved hugely successful in getting academic colleagues on the #TeamUofG train - the first time we'd ever had this kind of buy-in for a social campaign! 4) Peppering messages through various communications channels - email, Yammer, MyGlasgow e-newsletter so we could reach and engage as many people as possible. 5) We also needed our student bodies on-board and so gate-crashed a big Freshers' planning meeting to brief all 4 unions and get them to hand out tattoos for Freshers' helpers to wear and pepper the # through Freshers' activity. We wanted to include all members of #TeamUofG in our campaign so couldn't omit our fabulous alumni. 1) We needed to make the messaging from alumni relevant and decided they would feature in the latest stage of the campaign during Freshers' week - asking them to welcome new students to UofG and/or give them advice about how they got the most out of their UofG experience. A campaign like this needs to evolve. 3) Giving people options and providing them with example messaging - we gave our alumni a variety of options from sending a simple welcome to new students to creating short videos wearing the tattoo and giving Freshers' advice about making the most of their UofG experience. Some sent posts out from their own accounts while others sent us videos to put out direct from UofG channels. The variety kept content fresh! 1) You can't assume everyone will see your social activity so you need to do offline promotion to sign-post people to your channels and adopt the hashtag. It's completely obvious but the more people see your # the more widely it will be used. So we worked with the Recruitment Marketing team to have a pop-up tattoo parlour on campus during Freshers' Week handing out tattoos and wearing branded t-shirts. We also had welcome banners made to go on the campus railings. 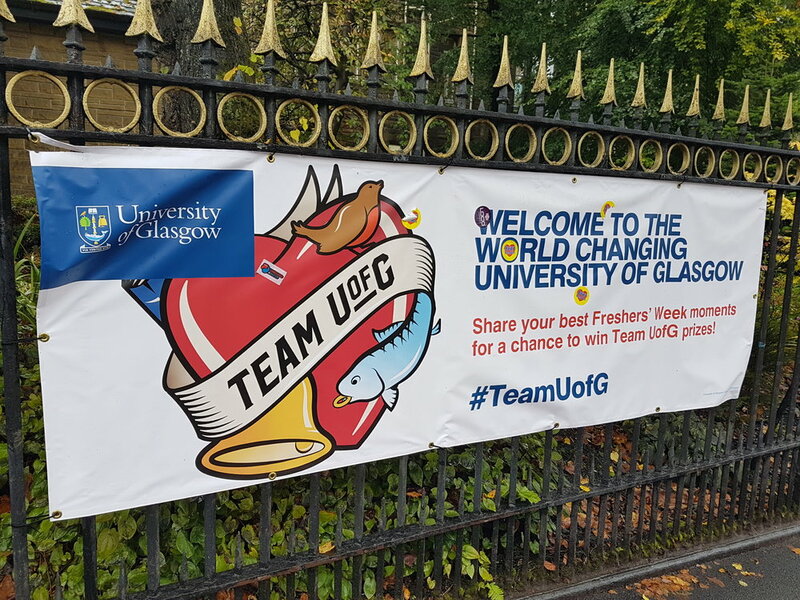 2) #TeamUofG t-shirts were produced that could be bought in the shop, we had #TeamUofG signs and there was a daily Freshers' Week competition on our Snapchat to win a #TeamUofG goodie bag. And that's a real whistle-stop summary of how we made our #TeamUofG campaign fly! Keep your eyes peeled for Part 2 when Dan will talk you through the creative elements and do some number crunching to review how we did!